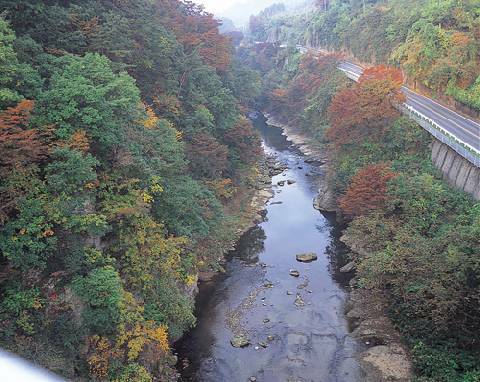 The Akaya River and the beautiful valley that extends for approximately one kilometer. Kuroiwahakkei (the eight sights of Kuroiwa) gets its name from the eight scenic spots located within, including Ogiwa and Kinukake no Matsu. From the fresh greenery in spring, to the spray of water that splashes onto strange shaped rocks and cools you off in summer, to fall, dyed into a rainbow of beautiful colors, to winter, dusted with snow, each season captivates the hearts of those who visit.